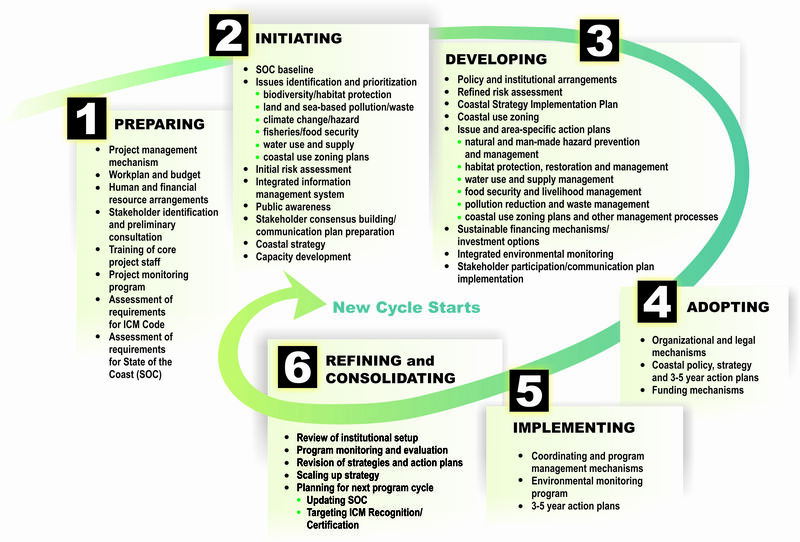 Developing the policy direction and management option of an integrated coastal management (ICM) program is achieved through a set of processes known as the ICM Cycle. This cycle is broken down in six stages, each with a subset of essential steps that need to be completed before moving up to the next stage. Before the cycle begins, a thorough evaluation of candidate sites is done. This evaluation, following a selection criteria, is important in determining the sites’ sustainability for ICM implementation. When the sites have been identified, the cycle can then begin. This stage establishes a project management mechanism in order to organize staff, set up a project coordinating committee and identify working relationships with local government. Budget is ensured and training of staff is prioritized for effective project management and implementation. Initiating the ICM program includes the identification of environmental issues that require intervention. Aside from profiling, an initial environmental risk assessment (IRA) allows for priority ranking of environmental concerns. An integrated information management system (IIMS) is also established to store information which is shared among the various line agencies. Results from these assessments and consultations are then developed into strategies and action programmes. The Coastal Strategy provides a framework within which more issue-specific action plans can be developed. This stage prepares a Coastal Strategy Implementation Plan (CSIP) that addresses risks and focuses on prioritizing action programs within the Coastal Strategy framework. An integrated environmental monitoring program is developed to assess changes in the environmental risk levels, and results from this are used to refine the risk assessment. Data gathering is focused on interventions directed as risk management. Development and implementation of a coastal use zoning plan is also an important undertaking at this stage, while stakeholder consultations are done in a continuous process. At this stage, the Coastal Strategy and action plans are adopted by the local government authority. This is facilitated by disseminating information to the general public of the environmental issues and risks associated with public health, ecosystem health and the society’s well-being. This stage sets up an interagency and/or multi-sector coordinating mechanism. The project management arrangements can be transformed to be essential parts of local government institutional structures, and financial resources are utilized to operate the ICM program. Action plans that offer quick results are selected to build confidence of the stakeholders. Refinement of the Coastal Strategy and action plans may be necessary to respond to the stakeholder consultation process feedback. Local staff is expected to gain experience, thus resulting to more effective implementation of the action plans. The ICM program then moves to the next cycle. New actions are thus formed and implemented in the new cycle, based on the experience and foundation established in the previous program.